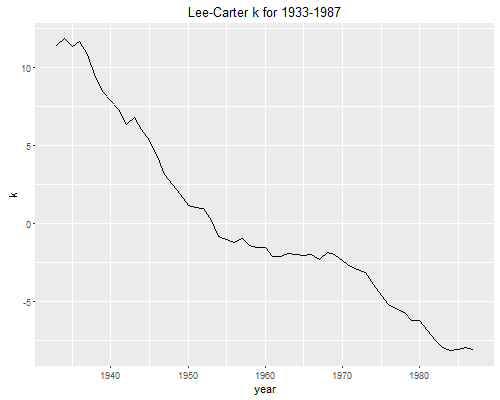 We apply the Lee-Carter approach to forecasting U.S. mortality, doing all calculations from first principles. This log is best read in conjunction with the class handout. 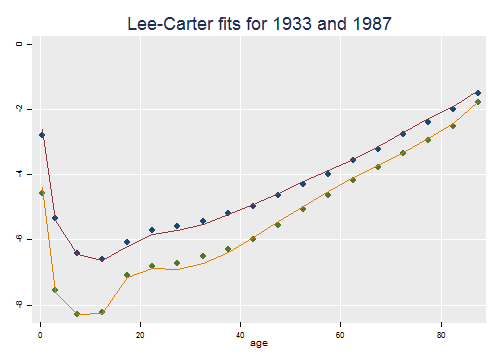 Lee and Carter use U.S. mortality rates for conventional 5-year age groups up to 85+ by single calendar years from 1933 to 1987. You can get the data from mortality.org, select U.S.A. and navigate to life tables. The code below shows the steps I followed after saving the web page as a text file bltper_5x1.txt. We need to code age from the group labels and, more importantly, compute the rate for the open-ended age group 85+. For fitting purposes we select ages up to 85 and the years up to 1987, but later use all ages and years.
. replace age = "110" if age == "110+"
Next we compute the log of the rates. The calculations that follow are a bit simpler is we reshape the data We will store them in a matrix of 55 years by 19 age groups. The first thing we need is the mean log-rate for each age group. This is easily computed using the rowmeans function in egen colMeans(). The results are remarkably close to Table 1 in the original paper. We are now ready to compute the Singular Value Decomposition (SVD), which writes M = U D V__ where U and V' are orthogonal matrices and D is a diagonal matrix of singular values. Before we call the function we need to define the output matrices. In fact we need just the first left and right singular vectors. The first column of U times D1,1 times the first row of V' has the best rank-1 approximation to the input matrix. Lee and Carter normalize the first row of V so it sums to one and call it b. 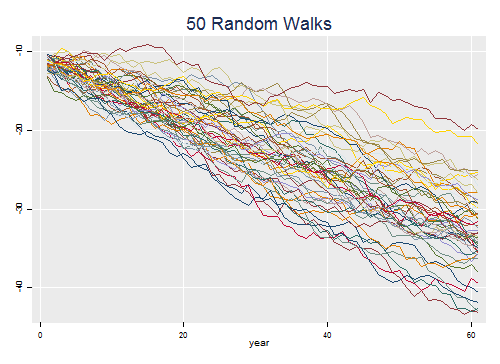 This vector models how the different age groups react to mortality change. These values are remarkably close to the b's published in Table 2. 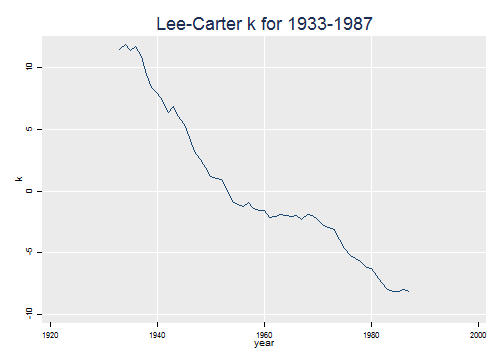 Lee and Carter also take the first column of U, multiply by D1,1 and multiply by the sum of the first row of V' (to cancel the division) and call that k. This vector captures overall mortality change over time. 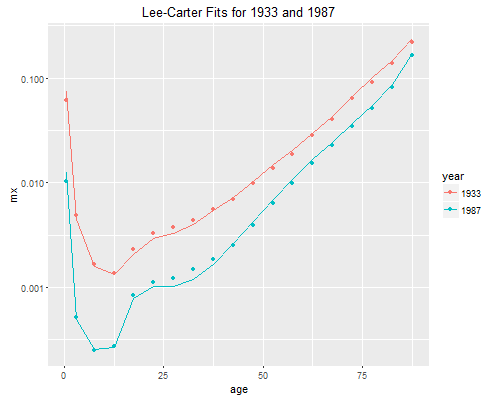 The next task is to compute the Lee-Carter fits to the mortality rates in 1933 and 1987, reproducing part of Figure 2 in the original paper. We are done with Mata, so we copy b and k into Stata.
. gen e = . This being a simulation your results will differ from mine. 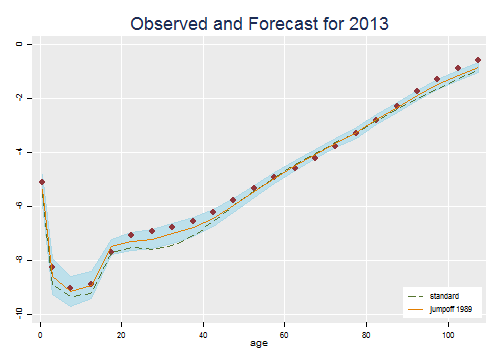 You should note that there is considerable uncertainty about the level of mortality 50 years into the future. 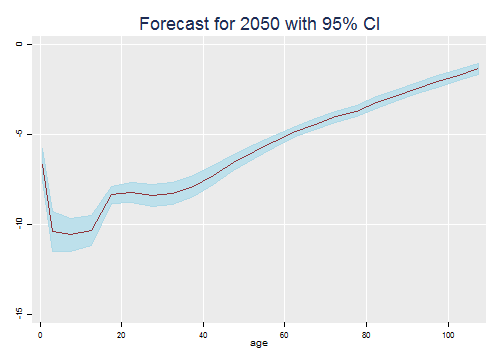 Let us forecast age-specific mortality in 2050 starting from 1989. To this end we will use the official values of a and b, which I saved in a text file called LeeCarterAB.dat (also a Stata file LeeCarterAB.dta) in the dataset section. 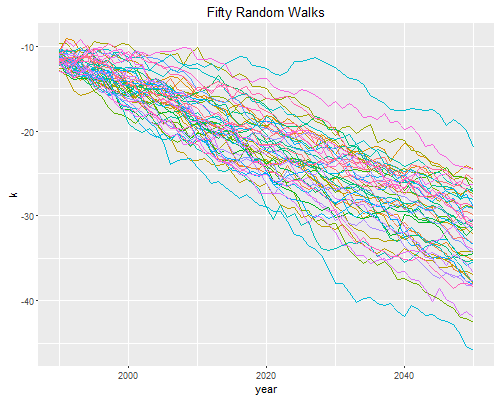 These values extend the two sets of parameters to age 105+, but are otherwise practically identical to the estimates we just obtained. The final issue concerns the choice of jump-off. 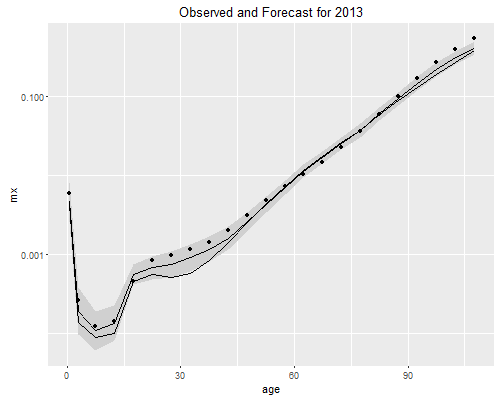 Below we will make a "forecast" for 2013, the latest year for which we have data. 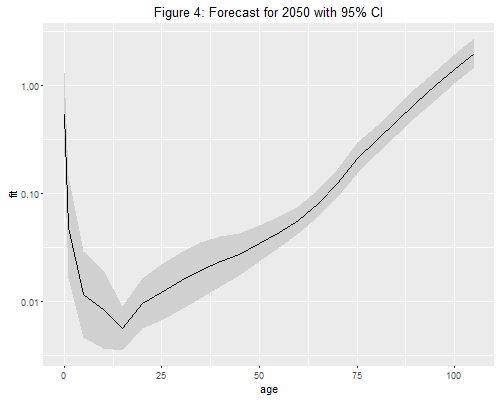 The prediction is not too good for young adults because of a slight lack of fit in 1989 which propagates in the forecast. The solution is to "jump-off" from the actual 1989 rates. The performance of the model with the correct jump-off for a 24-year forecast is nothing short of remarkable. And that's all folks!